Google+ is going popular popular day by day. If you are also a Google+ user, check this new free app G+ Notifier. 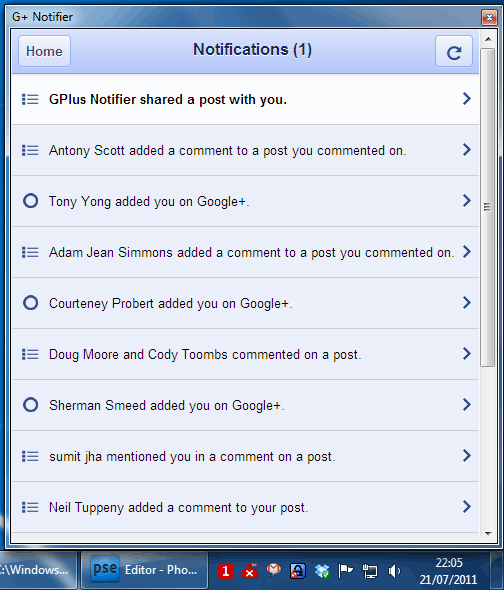 G+ Notifier is a Windows utility that sits in the notification area and alerts you to notifications in the Google+ social network. It’s similar like GClient app that we discussed here some days back. This new notification tool woks from the system tray and instantly pops up a message balloon when a new message or post update enters at your Google plus profile. To use it just simply download the app and extract the zip file into a folder on your computer and run the file “GPlusNotifier.exe” to start the program. Whenever a new reply arrive at you Google+, G+ notifier shows them into a bubble pop-up message, showing the total number of items which you haven’t checked out yet. Now to view all of these notification just click on the icon at the system tray and it shows all the latest and previously received updates from your profile. And with double-click you can open your Google+ stream in default browser.